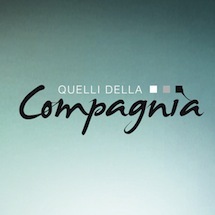 Since March 2013 the film-related events of the Casa del Cinema, organised and promoted by the Fondazione Sistema Toscana per Regione Toscana, have had a new logo: “Quelli della Compagnia” (“Those of the Company”). Not only does the logo recall the new permanent headquarters of the Casa del Cinema in Tuscany – the Teatro della Compagnia movie theatre – but it also represents the virtual company, the community of thousands who love high-quality cinema and have followed the film-related initiatives of the Fondazione Sistema Toscana Mediateca per Regione Toscana, including the festivals of the 50 Giorni di Cinema Internazionale a Firenze (50 Days of International Cinema in Florence), the director-attended premieres, the shows, the gatherings, the conferences, and the cultural events. In March 2013 an important partnership was also launched with the movie theatres in and around Florence that are part of the Firenze al Cinema circuit, resulting in a series of “Quelli della Compagnia” premieres in the following theatres: the Adriano, the Colonna, the Fiamma, the Fulgor, the Marconi, the Portico, the Principe, the Grotta in Sesto Fiorentino and the Cabiria in Scandicci.